"Saldus Maiznieks", Ltd., is 100% Latvian-owner company with all Latvian values inside in our hearts. That is why we think, that bread is sacred food, what can not be thrown out under any circumstances. As we are baking natural bread without any improvers, and another chemical ingredients, sometimes not all breads turn out to be perfect in looks. 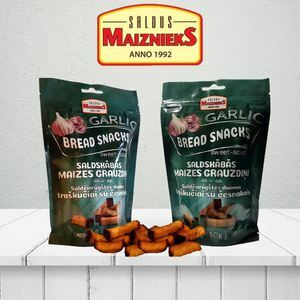 That's why we are giving them second chance to bring joy to our customers - we make tasty and spicy garlic bread, which is very popular not only around Midsummer festival in summer, but all year long. 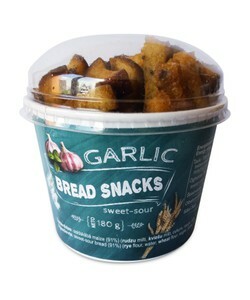 Our sweet-sour garlic bread has become so popular, that we developed new package, so this product could travel to near and far places. Translation on package is in Lithuanian, English and Latvian. "Seed bread toasts WITH TOMATOES"
It is latest product in our snack line. "Seed bread toasts with tomatoes" are made of seed bread with tomato spice. It is very delicious in combination with soups and different kind of salads. Of course, it could be used also as snack. "Sweet-sour" garlic bread is made out of the highest quality sweet-sour bread, what is made with natural yeast and scald. We are very proud of this product, because it is one of the best export products we have, and also it is very popular in our Latvia. 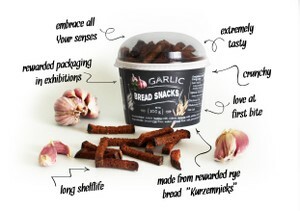 "Rye Garlic bread" is made out of our best rye bread "Kurzemnieks". Have You ever tried to find perfect solution for question, which has been driving You crazy for a long time? If yes, You will better understand how our garlic bread got its special taste. After a long day father and son sat down for a cold beer and talked about future. Word by word, and perfect garlic bread recipe was born. The key answer is, that it has to be finest bread we have - rye bread "Kurzemnieks". The very next evening they tasted new garlic bread together with beer and understood, that perfect combination has born. This is part of life - sometimes You look for something so hard, that only thing that You have to do is wait, till it gets to you. And while You are waiting - choose perfect beer and our rye garlic bread!